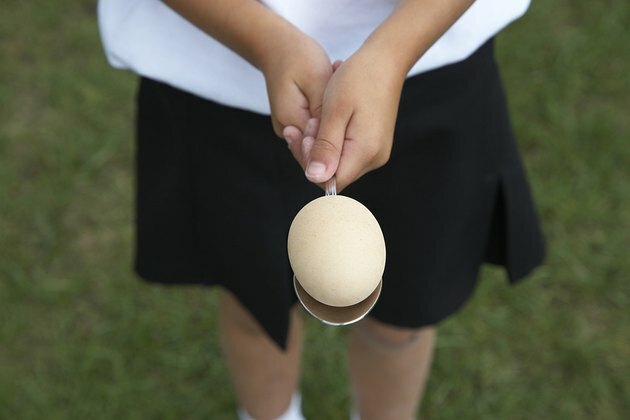 Almost every student has to participate in an egg drop project at some point, and there are probably almost as many egg drop containers as there have been students required to make them. The basic rules are that the egg cannot be permanently affixed to the container and it must survive a fall of two to three stories. There is also often a weight limit on the project, so lightweight projects are to be desired. Cut one leg off of the pantyhose and put the egg inside, centering it along the length of the leg and tying a knot in the hose on each side of the egg so it stays centered. Cut a hole in the center of the two opposite sides of the box. If the box is rectangular, not square, choose the two sides that are farthest apart so the egg will have the most "bounce" room. Open the box and place one bag of poly-fil on the bottom. If the whole bag is too big to fit, open it and fill the box halfway with poly-fil. Place the hose-encased egg on top of the poly-fil and thread each end of the pantyhose leg through the holes on the sides of the box, knotting the hose on the outside of the box to tightly suspend the egg above the poly-fil. Finish filling the box with poly-fil above the suspended egg, seal the box with heavy packing tape and head off to the proving grounds with confidence. Weigh all your project supplies before you begin to make sure the finished product will be within weight limitations. If possible, have extra supplies on hand so you can give the project a test run before while you still have time to make necessary changes or substitutions.